The Georgia Municipal Cemetery Association is a recognized resource for cemetery professionals, historians and preservationists interested in cemetery preservation, advocacy and education. Our cemeteries, whether large or small, reveal the richness and historic fabric of Georgia's history. Through innovative workshops and conferences, GMCA's goal is to be a key resource to preserve our treasured cemeteries and burial grounds. It's not too late! There is still time to host a workshop in your region. Contact your region representative today. We have already begun planning our 2019 workshops and conferences. If you have a topic that you would like to hear at an upcoming workshop or conference, we encourage you to contact your Region Director. We will do our best to accommodate your requests. If you have a location that you feel would make a great place for a workshop or a conference, please let us know. We want your feedback! Please take a moment and complete our short survey. Thank you to all who attended the 2018 annual conference in wonderful Dalton, GA. We had another exciting and informative agenda. Thank you to our sponsors for helping us make it all happen. We will be in beautiful Savannah, GA for our 2019 conference. We have already begun working on the conference agenda. Let us know what you would like to see by completing the conference survey above. We will do our best to fulfill your requests. Cemetery professionals, historians and preservationists have enjoyed workshops that have been held in Savannah, Social Circle, Brunswick and Vienna. Our workshops offer unique, in-depth approaches to a variety of topics that have included cemetery rapid assessment, disaster preparedness, stone restoration, ground penetrating radar and using aerial videography (drones) to map and record cemeteries. Did you miss a workshop? Sign up to receive email notification about future workshops. Henry Milhollin of Douglas, GA and Stan Rogers of Rome, GA demonstrate how to clean a soiled monument using D/2 at a workshop in Vienna, GA.
On the third Saturday of each December, Wreaths Across America, a national program that honors veterans with a mission of Remember, Honor, and Teach will place wreaths at more than 1,500 cemeteries across the country. This tradition began more than 26 years ago when Maine wreath maker, Morrill Worcester and his business Worcester Wreath Company of Harrington, Maine donated 5,000 wreaths to Arlington National Cemetery to be placed at veterans’ graves. The event is meant to in part, honor those who made the ultimate sacrifice in their service to our country, while remembering those who still actively serve in the military today. For the 6th year, Macon, Georgia’s Historic Riverside Cemetery & Conservancy will be among the more than 900 cemeteries taking part in this year's "Wreaths Across America" ceremony. On December 15th, 2018 at Noon EST, volunteers of all ages will brave the winter elements, placing live balsam wreaths on veterans' graves during simultaneous services around the nation. Sponsored wreaths can be designated for placement on the specific grave of a loved one, or left undesignated and placed on one of thousands of gravesites that may never be visited or honored by a loved one. Last December over 900 fallen veterans were posthumously recognized at Riverside Cemetery by family members, friends, anonymous donors and local businesses. Thousands of veterans buried in Historic Riverside seem forgotten, never visited by friends or family. Placing a wreath on their graves is a simple yet beautiful way to honor and remember the lives they lived and the sacrifices they made for our freedom. Riverside Cemetery & Conservancy is proud to partner with Wreaths Across America once again this year for their annual wreath laying ceremony and we look forward to continuing to serve as a host site for this event in our ongoing commitment to honor our veterans and families. If you are interested in sponsoring a wreath or volunteering to place sponsored wreaths at Riverside, just call our office @ (478) 742-5328 or visit our website @ ww.riversidecemetery.com. A commercial development project In Savannah’s Southside district has recently uncovered a small 19th century cemetery. Gravestones found on the site reveal it to be a family plot for the Densler family. Construction has been halted and an investigation is underway to determine the number of graves and the boundaries of the cemetery. The developer is in the process of contracting a cultural resources management firm to conduct the archaeological investigation of the site. A preliminary background search of the Densler name in Georgia showed that they first arrived in the early colonial period, during the time of James Oglethorpe. Conrad Dantzler, a German-speaking Swiss, landed in Savannah in late 1737 along with other Lutherans seeking freedom from religious persecution. Conrad and his family served for several years as indentured servants. Those in indentured servitude helped to fill a labor shortage in the young colony, as the Board of Trustees initially prohibited landowners from owning slaves. Their passage to America would be paid, and they would eventually receive tracts of land following their term of service. Conrad received a land grant near the small village of Vernonburg, just south of Savannah. It was Conrad’s son Heinrich that anglicized the family name, himself becoming Henry Densler. 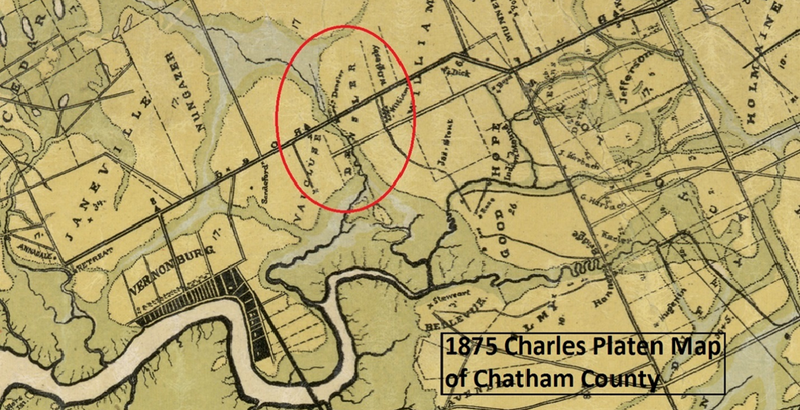 Several generations of Denslers owned this land and it remained with the family until at least 1875, when a map of Chatham County still showed the property belonging to a Densler. It was common practice during that time for families on remote farmsteads to bury their dead on the family land. All three individuals on the gravestones date to the early 19th century. Today, this area is a bustling residential and commercial district and the recent completion of the nearby Truman Parkway has brought renewed interest in development. Discovering graves can be problematic and costly for developers and a decision must be made to either work around or relocate the graves. Relocation would require locating any possible surviving descendants and consulting with them throughout the process. Additionally, approval must come from the city or county before any disinterment can take place. 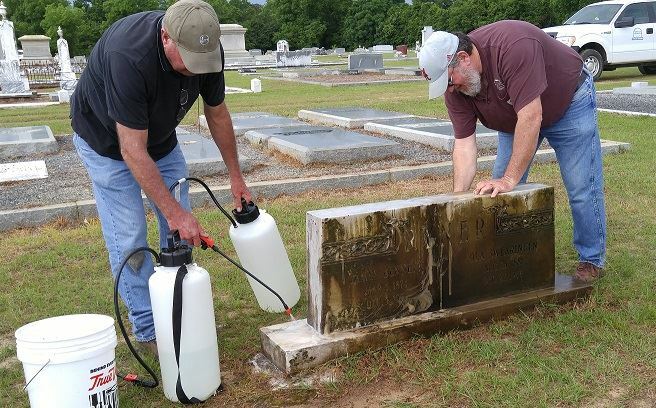 Cemetery professionals, historians and preservationists from around Georgia rely on GMCA as their number one resource for information!